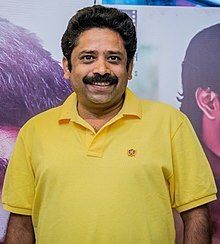 Seenu Ramasamy is an Indian film director known for his Tamil films. A student of popular cinematographer and director Balu Mahendra, he made his debut with Koodal Nagar starring Bharath, Bhavana, and Sandhya. His second film Thenmerku Paruvakaatru won three National Film Awards, including the National Film Award for Best Feature Film in Tamil. Through this film Seenu Ramasamy introduced popular hero Vijay Sethupathi into the world of Cinema. He is also the one who coined the term "Makkal Selvan" to Vijay Sethupathi in his film Dharma Durai. ^ "Newcomers in Seenu Ramasamy's next". Times of India. 30 May 2010. Retrieved 27 June 2010.